Those who are stuck in the old age ruled by emotion will have a much different view of freedom than will the Aquarian thinker governed by mind and reason. The astral approach to freedom is to take the black and white approach. This means the person will either discount rules and regulations so he can have his way or to support an excess of them to control the other guy. The Piscean character will assume that the other guy cannot be trusted with much freedom as he will abuse it whereas he sees himself as supporting freedom and he wants rules dropped that may control him. An example would be the guy who wants drugs legalized because he wants the freedom to use them, but wants strict controls on guns as he does not own one. The mentally polarized can see that the principle involved in both is the same. They both have a dangerous side and if we trust our fellow humanity with one then we should with the other. The mentally polarized can see that much more can be accomplished with maximum freedom than with excessive rules, regulations and laws. The right amount of law insures freedom but excess destroys it. There are around 40,000 new laws and regulations passed every year in this country and anyone but a madman should realize that is too many. How many can name even a dozen passed last year? Very few. There are so many that most of us broke several of them yesterday yet probably did not know what they were. The advantage for corrupt authorities having so many laws is that they can turn most anyone who offends them into a lawbreaker and go after them. I have already written a lot about the Principle of freedom. Here is an excerpt from my forthcoming book on Principles. The principle of freedom is a mystery just as most principles are. Why? Because it takes a certain degree of consciousness to apply the second key of judgment to understand and apply it. When freedom is discussed among all people of divergent views it is interesting to note that all of them see themselves as struggling for freedom, even those who are enslaving others. Hitler often spoke of freedom. The Taliban speaks of their own freedoms. The Old South maintained they needed slaves to insure their own freedom. Abraham Lincoln noted this and observed that some people have a pretty strange idea of what freedom is. Some think that freedom can only exist in a state of anarchy, but this is illusion for it takes a number of laws to insure the maximum freedom of the whole. Others think we need laws to cover every detail of living to insure freedom, but too many laws and rules hinder freedom. There are those who think life is not fair so they make restrictive laws to make everyone equal thinking greater freedom will result. This usually results in less fairness and diminished freedom for the whole. The problem with freedom is that people view it from their own restricted vision. Instead of looking at it from its effect on the whole they look at it from the view of their own little isolated world. It may be true that a man could have had a slave and the slave helped him have a temporary increase in his own physical freedom, but the whole was less free. The problem with freedom is we are looking for the manifestation of maximum freedom for the whole and to obtain this there has to be some restrictions on the individual. For instance, the individual burglar must not be given the freedom to break into homes. On the other hand, too many restrictions will suffocate freedom. Only those who see the fine point of balance in the middle and how the whole is affected will understand. What is true freedom then? Again, it is the removal of restrictions either imaginary or real, so the power of decision has complete freedom within the sphere of its plan. Thus the true principle of freedom lies in the idea that the soul energy to accomplish is released so its life can flow through the ideas and thoughts of the pilgrim until all desires are fulfilled. No matter what your belief system there will come trials in harmonizing the Principle of Freedom with personal feelings. He who believes in the Principle of Freedom yet is against abortion must allow the woman her freedom of choice whether that choice be right or wrong. He who believes in the Principle of Freedom yet is against gays living together must allow them that freedom of choice whether that choice be right or wrong. He who believes in the Principle of Freedom yet is against illegal drugs must allow the user his freedom of choice whether that choice be right or wrong. He who believes in the Principle of Freedom yet is against Neo-Nazis promoting their doctrines must allow them that freedom of choice whether that choice be right or wrong. He who believes in the Principle of Freedom yet is against cutting down trees must allow others the freedom of choice within their own sphere whether that choice be right or wrong — as long as no great harm is done to the earth. He who believes in the Principle of Freedom yet is against rules being laid down in a school, group or business must allow others freedom of choice within their own sphere of activity whether that choice be right or wrong — for the seeker retains the choice to work for another company, join another group or take another class. Each potential disciple will have some final temptation to support the unreasonable restriction of others in the name of promoting his personal desire to see that which is good triumph. The deception is that true good can only magnify in an atmosphere of maximum possible freedom. So the principle that the gathered lights will always apply is maximum freedom for the whole. 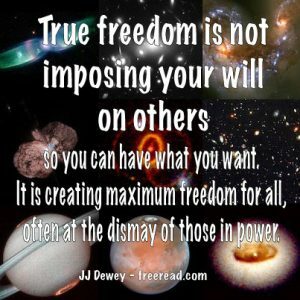 The only time any freedom is taken away from the individual is when it increases the freedom for the whole. Like I say, we take away the burglar’s freedom because the burglar takes away the freedom of the whole so by taking away the burglar’s freedom we increase the freedom for the whole. The principle involved with freedom is the wholeness aspect; maximum freedom for the whole. The seat belt law is a simple little thing but it’s totally unnecessary to have a $200 fine for a seat belt infraction. It may force us to buckle up but on the other hand it creates big brother telling us what to do with outward authority over our lives. What we need to develop is power to have our own personal freedom and do what is right because we decide to do what is right. We do right because we see what is right; to help our fellow man because we want to help our fellow man. By doing these things we can enhance the flow of the energy of God because the energy of the Holy Spirit operates on total freedom. Where freedom is taken away, the Holy Spirit does not flow. People have gone to very oppressed nations and visited them, particularly Russia when it was totalitarian and was in full power-it’s a lot better now than it was-but when people have gone and visited these oppressed nations, people look depressed, they don’t talk to each other, there is no flow of ideas. They’re afraid that somebody will report what they’ve said. They’re afraid all the time. There is a spirit of fear. They’re doing what’s right maybe, according to the state, but they have no freedom. The greatest evil is always generated when people are forced to do what is right. The force to do what is right has so much power behind it because they say, “We need to create a law to make this happen.” People say, “That would be good. Let’s go ahead and do it.” They don’t even think about the principle of freedom involved. They never argue the principle of freedom. When our legislators are talking about passing laws, they never think they’re taking away freedom. The argument is always over making people do what’s right. If they would only argue over what the maximum freedom would be generated. How can we make the law so freedom will not be infringed, freedom of the whole will be amplified rather than held back. There are, like I said, a small handful of laws for robberies and rapes and murders and these types of laws, are good for people but there are too many laws that infringe freedom.